Canoa Quebrada Restaurants Bars and Shopping. 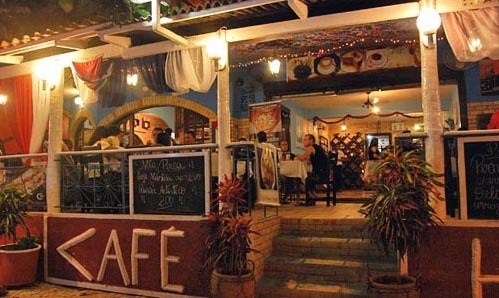 Almost all of the Canoa Quebrada restaurants bars and shops are located on the main street, Rua Dragao do Mar or Broadway as it is affectionately called by the locals. 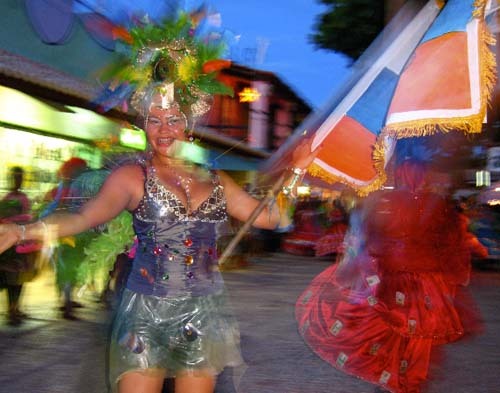 Broadway runs for approximately 500 meters from the entrance to the village all the way to the bronze statue of native abolitionist, Francisco Jose do Nascimento, Chico da Matilde. 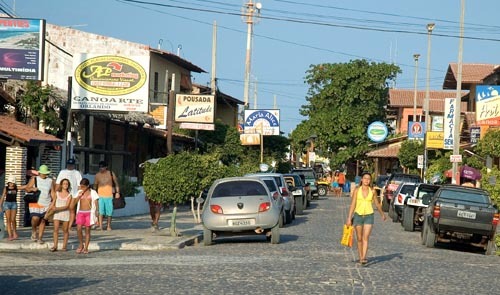 View of Broadway Canoa Quebrada from the entrance of the village. to Canoa Quebrada R$ 50,00 or Jericoacoara R$ 75,00 ! There is parking along the first 150 meters or so with the remainder closed off to traffic. Between the entrance to the village from the main road and where the street is closed off to vehicles there is a small supermarket, pharmacy and shops selling souvenirs handicrafts, and swimwear. The first time you stroll down Broadway you may feel a bit overwhelmed by all the Canoa Quebrada restaurants and bar options. Some of the places that have been there from or since way back when are still the most popular. 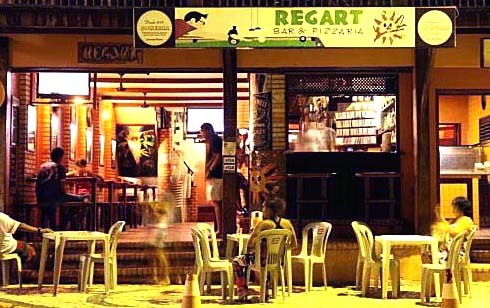 Everyone who lives in Canoa Quebrada or visits on a regular basis is familiar with the Regart Bar e Pizzeria. Where you will find the locals sitting along the sidewalk or at the bar enjoying a cold drink early in the evening. The Regart has a great sound system and music CD/DVD selection, a satellite dish with large screens where the locals come to watch the important soccer matches. There are snooker tables on the second level and a third level with views overlooking Broadway. Just past the Regart Bar e Pizzeria to the right is the Cafe Habana, one of the most popular restaurants in Canoa Quebrada offering a varied menu, and large portions to go along with a relaxing atmosphere and friendly service. It’s one of the only restaurants on Broadway open for lunch. The owner Armando, a long time resident of Canoa Quebrada speaks Portuguese, Spanish and English fluently. Is almost always present and can be very helpful for those looking for information on just about anything in the village. Broadway and the Bar Todo Mundo in full swing after hours in Canoa Quebrada. 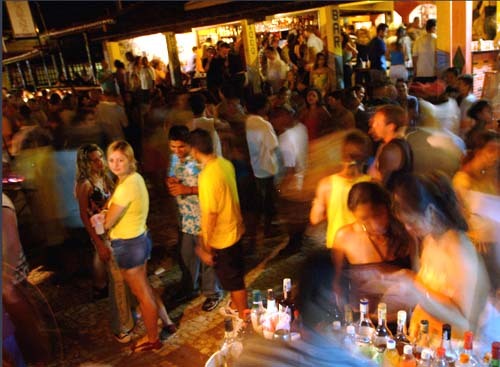 Bar Todo Mundo is one of those places that has been around since way back when and truly has its or a place in the history or Canoa Quebrada's infamous nightlife. T-shirts, post cards, souvenirs for sale on Broadway.. 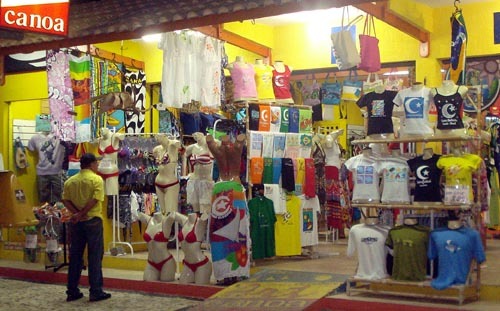 There are shops along Broadway with a large selection of everything from post cards and t-shirts to beach and swim wear. Others that specialize in locally made handicrafts, paintings and sculptors. Author - Gerardo Simonetti resided in Canoa Quebrada between 1999 and 2001 and offers advice on living and traveling in Northeastern Brazil.